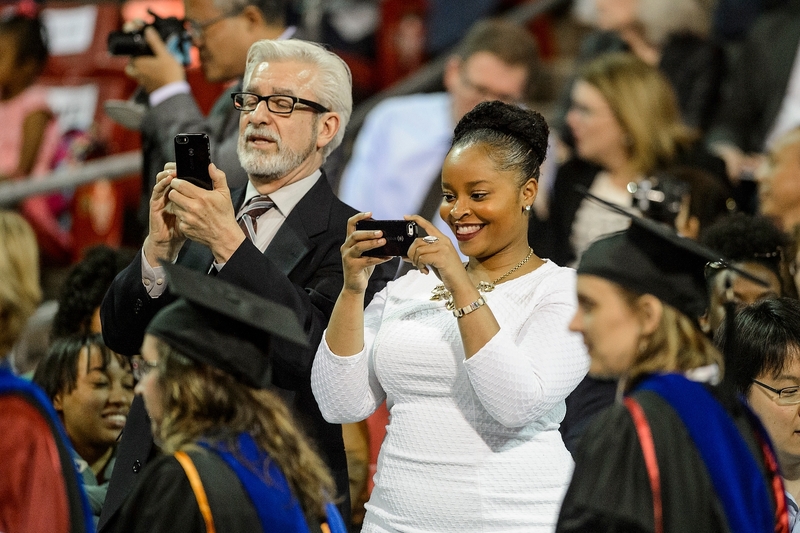 After countless hours of classes, test-taking and homework, more than 900 University of Wisconsin–Madison graduate and professional students received degrees Friday night at the Kohl Center. She advised the graduates to listen to others, have a sense of humor and take risks. Regent President Regina Millner talked about how much things have changed since she graduated from UW–Madison 30 years ago. “But one thing that hasn’t changed – and won’t change – is the importance of a quality institution, where dedicated and creative faculty inspire students to want more, where innovative research expands possibilities, where fellow students challenge and encourage their peers,” Millner said. The new graduates had inspiration from photojournalist Lynsey Addario, biochemist William J. Rutter and former Wisconsin Gov. Tommy Thompson, all of whom received honorary degrees, given to recognize individuals with careers of extraordinary accomplishment. Addario received her bachelor’s degree in Italian and international studies from UW–Madison in 1995. The recipient of a Pulitzer Prize and a MacArthur Fellowship, she spoke of her parents’ encouragement to follow her heart and do what she believed in. “To think that one day I would be honored with a doctorate degree is incomprehensible to me — particularly in recognition for my work as a photojournalist, a work that has always been a labor of love and passion,” Addario said. Rutter held a postdoctoral appointment with noted scientist Henry Lardy at UW–Madison’s Institute for Enzyme Research early in his career. A pioneering biochemist, Rutter helped lay the foundation for the emerging field of biotechnology. Research breakthroughs under his leadership include the first cloning of genes for insulin and growth hormone, at the University of California, San Francisco, and a recombinant DNA vaccine for hepatitis B and decoded genomes for HIV and hepatitis C viri, at the Chiron Corp.
Rutter spoke of how he was encouraged to test ideas and use new approaches. “As I reminisce, I think of four joys,” Rutter said: continuing to learn in one’s field, teamwork, competition and contributing to society and humanity. “And today, as then, there is no better time to be a professional in life sciences,” Rutter said. Thompson received bachelor’s and law degrees from UW–Madison in 1963 and 1966, respectively. He is the longest-serving governor in Wisconsin history, serving for 14 years. Subsequently, he served as U.S. Secretary of Health and Human Services. 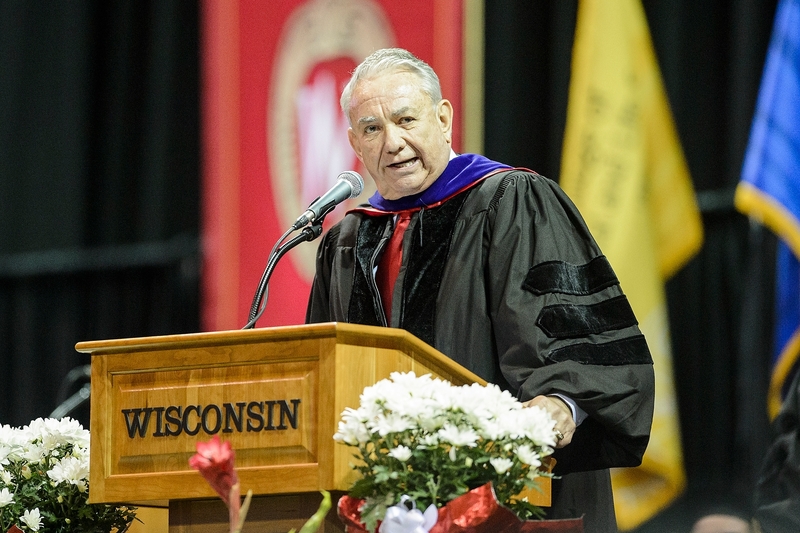 Thompson spoke with great pride and gratitude for the university and encouraged the graduates to go out into the world remembering the Wisconsin Idea.